Mike Uzel, spokesman for Bermuda Advocated for Responsible Development, speaks at a community meeting April 11. The second recent informational meeting about a proposed megasite in the southern part of the county was more orderly than the first, according to two people who attended both. The first meeting was held on the evening of April 10 at Carver Middle School with the second the following morning at Second Baptist Church. People were talking over each other at the April 10 meeting, said Todd Haymore, an economic development consultant working for the Chesterfield Economic Development Authority. 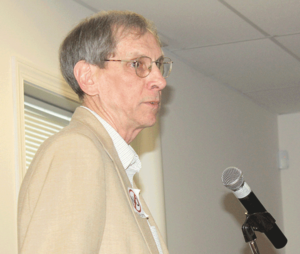 Haymore made a presentation at the beginning of the April 11 meeting and noted that no commercial buildings from the proposed industrial megasite would be visible from nearby homes. He noted a height restriction of 80 feet would be in effect for the main facility, which would be included in Tract A, the largest of three tracts in the latest revised proposal from the EDA. Building setbacks of at least 300 feet would be in effect, he said, noting that a 480-foot setback would be on the west from Glebe Point Estates and a 700-foot setback on the east from Stoney Glen South subdivision. In addition to building an east-west connector and a north-south road, the project could also include a rail spur that would be 700 feet from Branders Bridge Road. Haymore referred to five area sites and said that property values in those areas did not decline after construction. Those five are: Meadowville and White Oak technology parks, Hanover and Chesterfield airports and a Richmond Times-Dispatch plant. Some $1.25 million has been committed to the project – which will require a change in zoning from residential to industrial – with $250,000 to complete the rezoning and $15.5 million to purchase the land from the Shoosmith family. An estimated $7 million will be needed for right-of-way and easements, Haymore said. Once a company is selected for the site, $176 million will be funded from federal, state and local governments along with some private sector monies. Over 300,000 people are located within a 25-minute commute of the site, he said. Having access to potential employees is the top factor in attracting companies to an area, he said, adding that the EDA is involved in the first step of a seven-step process for attracting a company. Haymore’s comments apparently did not do much to persuade those in attendance, however, as the vast majority of public comments and questions were against the 1,675-acre proposed megasite. “Do you think this is the way to treat your citizens who bought into a rural area and not an industrial area?” Johnnie Humphrey asked. In response to a question about increased traffic that would be generated by industry, EDA traffic engineer Tim Davey said that truck traffic would increase only 10 percent. “But it’s still loud,” Rosapepe countered. Davey said that the industrial site would generate less traffic than the estimated 66,000 vehicles a day that could come with a full residential build-out of the site. “There’s always going to be some issues, but we believe there will be significantly less negative impacts than with current zoning,” he said. “These meetings really do matter. This is not a done deal,” Planning Commission Chairman Gib Sloan said, but not all were convinced. Haymore – who was secretary of commerce and trade in Gov. Bob McDonnell’s administration and secretary of agriculture and forestry under Gov. Terry McAuliffe – said his last job with the state involved attracting new companies. There are a number of companies looking to relocate to this region of Virginia in 2018 and 2019, and they require a minimum of 1,500 acres, Haymore said. “There is not a company in anybody’s back pocket,” he said, attempting to refute comments that one has already been secretly chosen. “You being the spokesman [for the project] does not give me any comfort level,” said Mike Uzel, spokesman for Bermuda Advocates for Responsible Development. Uzel highlighted two development projects the state promoted in recent years that have not gone according to plan. These include the Tranlin development to turn agricultural waste into paper products on Willis Road and another in Appomattox involving Lindenburger, a non-existent Chinese company. The former company owed the state $5 million, was slow in repaying and has not started the project yet due to technology issues, Haymore said, while the latter “company” was under investigation by the state police and the federal government. “Those two projects set in process some reforms to make sure they don’t happen again,” Haymore said, referring to reforms implemented last year at the Virginia Department of Economic Development. As far as traffic goes, Gary Cox said he suspects that some drivers will use Happy Hill and Harrowgate roads to avoid the new north-south road. Jeff Siffert, general manager of Wauford Group, said change is hard but noted that Rolls-Royce is paying $70,000 a year for new employees at its plant in Prince George County. Siffert, who is a member of the Chesterfield County Public Schools Technical Center Advisory Board, said he not only favors more high-paying jobs but the ancillary benefits it will bring to the Tech Center in the way of internships and curriculum advances. The jobs that a new automotive manufacturing facility would bring would help raise wages at other manufacturing jobs in the area, he said later. Duncan Stewart, a representative of the ChamberRVA, said students deserve the opportunity to have great new jobs. 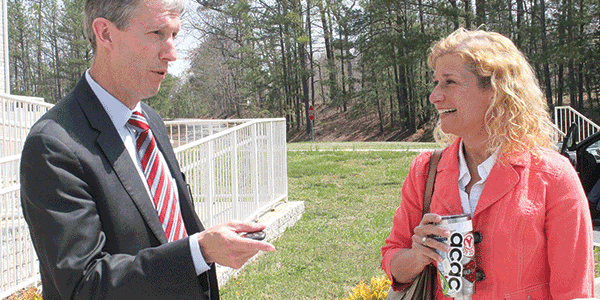 A third meeting was held April 16, and a fourth is planned from 6:30-10:30 p.m. May 7 at Carver Middle School.